Tri-bar clear headlamps for 1964-73 Mustang (except 1969). 7" with clear bulb.These ultra cool headlamps will make you stand out in a crowd. The finishing touches for a Resto-Mod or Show Car. These look great on or off. The internal chrome tri-bar, chrome bulb glare shield and highly polished mirror-like reflective back really stands out through flat clear lenses. They also function much better than original sealed beams or standard halogen headlamps. No modifications necessary. 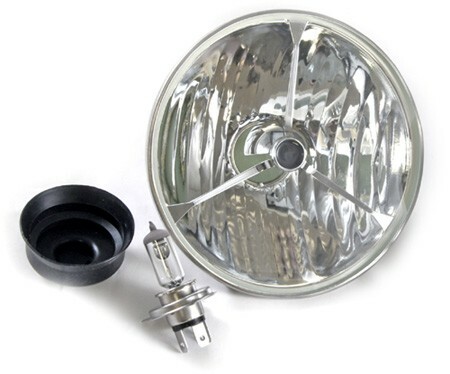 These will also work on other Fordâ€™s that use 7â€� lamps. Halogen H4 bulbs included. Also available in Cool Laser beam Blue. Hey! Check out our new matching Tri-bar fog lamps.